Napoleon is a well-known traditional large white cherry, and a typical "bigarreau" or firm-fleshed variety. The flavour is sweet/sharp, tangier than most of the modern varieties, and of very good quality. Also unlike the more modern cherry varieties which are typically dark red or black with dark flesh, Napoleon is usually classified as a white cherry, on account of its pale golden white flesh. 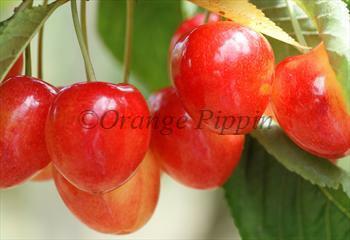 Please fill in the details below and we will let you know when Napoleon Bigarreau cherry trees are back in stock. The most popular traditional English white cherry, widely known as Kent Bigarreau. A white-fleshed cherry with an excellent flavour - a good alternative to Napoleon if you only have space for 1 tree because it is self-fertile. Napoleon Bigarreau is in flowering group 5. Napoleon Bigarreau is self-sterile and needs to be pollinated by another tree of a different variety nearby. As is often the case with fruit varieties, the ones with the best flavour can be the most difficult to grow. Napoleon's weak point is its susceptibility to infections of bacterial canker. You can minimise the likelihood of this happening by keeping pruning to an absolute minimum, since pruning cuts are an entry point for the disease. On a more positive note, Napoleon is a prolific bearer, and the tree is generally very hardy. It also flowers later in the spring than most varieties, which helps the blossom escape early frosts. The cherries ripen over a long period, allowing several pickings to be made - a particularly useful quality in cherries, which are always best when eaten straight from the tree. Napoleon requires a pollination partner, one of the modern self-fertile varieties such as Stella or Sunburst is a good choice, or traditional varieties such as Bigarreau Gaucher, or Merton Bigarreau. Despite its name, the Napoleon cherry is not French - it originates from Germany where there is a long history of cherry cultivation. The Napoleon Bigarreau variety played a key role in the development of the first self-fertile cherry, Stella. As a result a very large number of modern cherries are descended from it.